Enter twice daily for a chance to win the Novamex Uncap the Jackpot Instant Win Game (Over $300,000 in Cash Prizes). Good Luck! * The Jackpot Game ends on September 15, 2018 or while supplies last. All participants must have a valid email address. Limit two entries per email address per day. Open only to residents of the 50 United States and the District of Columbia, who are 18 years of age or older at the time of entry. a) During the game period, purchase any participating Novamex product, and remove the cap. Look under the cap to find a unique 7-digit Game Code – OR – b) Follow the link below to enter the game site, then register to receive a winning Game Code. LIMIT: Two free Game Code requests per day per email address. 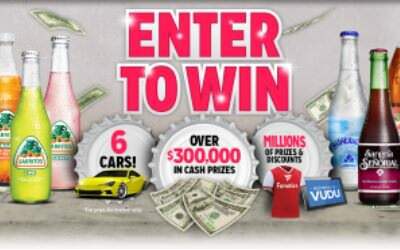 Two Grand Prizes: An automobile of winner’s choice not to exceed $30,000. Four First Prizes: Each winner will have the opportunity to select one of one-hundred sealed envelopes: – One envelope containing a new automobile of winner’s choice not to exceed $30,000. – Ninety-nine envelopes containing a $1,000 cash prize. Five Second Prizes: One hundred ninety two (192) Third Prizes: $500. – Two hundred-fifty (250) Fourth Prizes: $100. – One thousand (1,000) Fifth Prizes: $50. – Four thousand (4,000) Sixth Prizes: $25. DO NOT DISCARD YOUR CAP OR EMAIL, IF CODE OBTAINED THROUGH AMOE, AS YOU WILL NEED IT TO CLAIM A GRAND, FIRST OR SECOND PRIZE!